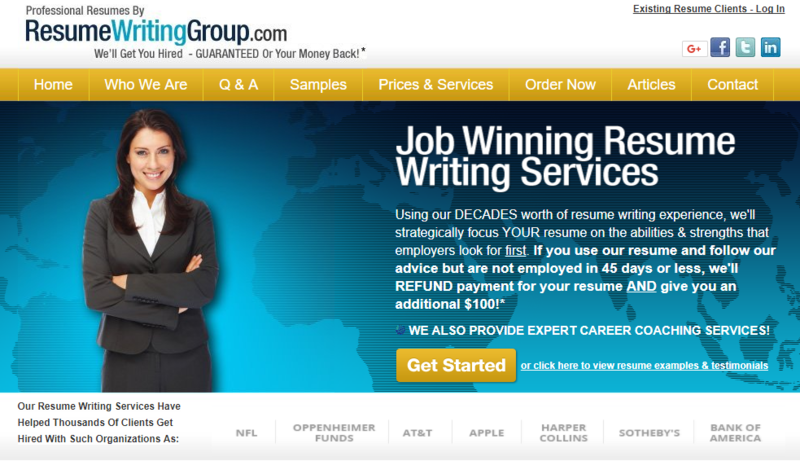 Established in 2005, Resume Writing Group seems like a reputable, perfect service for your resume writing. However, in the writing industry, the promises and appearance is not always what it seems to be. For example, we found this company’s website to be averagely designed, but rich in terms of content. Still, there are several other factors to take into consideration when writing our ResumeWritingGroup review. Even though statements such as ‘ABSOLUTELY the HIGHEST quality’ and ‘most competitively priced resume writing service on Earth’ are quite exaggerated, you will be happy to hear that ResumeWritingGroup.com is solid in terms of the range of services offered. Aside from the four resume writing options for student & entry level, all other professional resumes, senior & high-level executive resumes, and federal & government resumes, the company also writes various letters of recommendation, thank-you letters, and LinkedIn profiles. In addition to this, they have some interesting career counseling and coaching packages. You can pay the company to distribute your resume in the hiring market, or pick several companies that would choose you as an employee. If this is successful, it could be a great opportunity. 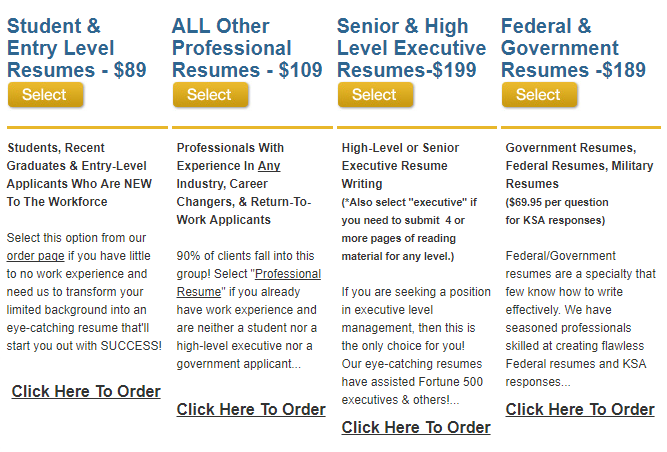 Resumes here start at $89, but they only depend on the four types of services we mentioned. This means that you will have to pay this steep fee regardless of the deadline you need your resume within, which can pose a bit of a struggle. And the starting price only applies to student and entry-level resume services, while other resumes cost up to $199! These are outrageously high prices, which is a disappointment since the company said their prices are the most competitive. However, their guarantee of sure employment or money-back does sound inviting, which is why we decided to check the quality this company offers. In addition to this, ResumeWritingGroup offers no discounts to any customers whatsoever. Do not expect a reward for your loyalty to the service, a reduced rate due to big orders, or any discounts that allow you to try out their services at a reduced fee. After ordering from the company, we agreed with what most ResumeWritingGroup reviews say – this company’s resumes are not worth the price they are charging. We got a resume of average quality, and learned that their guarantee is based only if you have proof that you sent 40 resumes to promising employers. What was wrong with our resume? First of all, the resume lacked some professionalism. When you choose the details about your resume, you are providing them with your information and if available, any previous resumes you have. Unfortunately, the new resume was almost exactly the same as our attached resume, which means we basically paid for nothing. According to the website creators, this is the only service that actually guarantees you will be employed in 45 days. However, after checking these discounts with the customer service, we found out that the company does not really offer revisions, and has an impossible to reach money-back policy. The most disappointing part of the company was their customer support service. After several attempts, we finally found one of their agents, but apparently, the guarantee has many tricks once you pay for your order. The agent dodged our request for revisions and finally said he will contact us with a confirmation, which he never did. Overall, ResumeWritingGroup.com is a legit writing service, but not a one you should choose when it comes to resume writing. The company does offer a wide range of academic services, but their pricing is very steep. In addition, feedback online and our experience points out to the same conclusion – that this company delivers average quality resumes at high rates. And finally, their customer service agents are very rude and the service is difficult to reach. Don’t use resumewritinggroup.com! They delivered my resume a day late and I didn’t even get a sorry, not to mention a refund or compensation of any kind! Thanks for the message, Krystal. Thanks for this Resume Writing Group review. I want to share my experience here, too. I ordered a resume from the service and my order was not worth the price they charge. They basically use the information you give them and put it in a nice template. I read many resumewritinggroup reviews before I chose the company, but I guess you cannot trust those either! This was the most terrible service I have used. My resume was not only badly formatted but actually had many mistakes in it. For a company that charges so much, this is a real disaster!